SINGAPORE - While spectators may see only a 30-min fly-past at the Marina South area, the event between the air forces of Singapore and Indonesia took some six months of planning. The joint working group organising the event marking 50 years of diplomatic relations was formed in April, and was tasked with working out all the different aspects of the event. These included planning of the flight formation and spacing, finding training spaces, and requesting for other flights to be shifted to accommodate the fly-past. The final rehearsal for the fly-past took place on Tuesday (Sept 5) at the Marina Bay Cruise Centre, where Prime Minister Lee Hsien Loong and Indonesia President Joko Widodo will witness the actual fly-past on Thursday (Sept 7). The public can watch the final event from various vantage points in the Marina South area from 2.30pm to 3pm on Thursday. Ten F-16 aircraft each from the Republic of Singapore Air Force (RSAF) and Indonesian Air Force (TNI-AU) assembled in the south-west of Singapore before flying past twice, once in arrowhead formations and another forming the numeral "50". 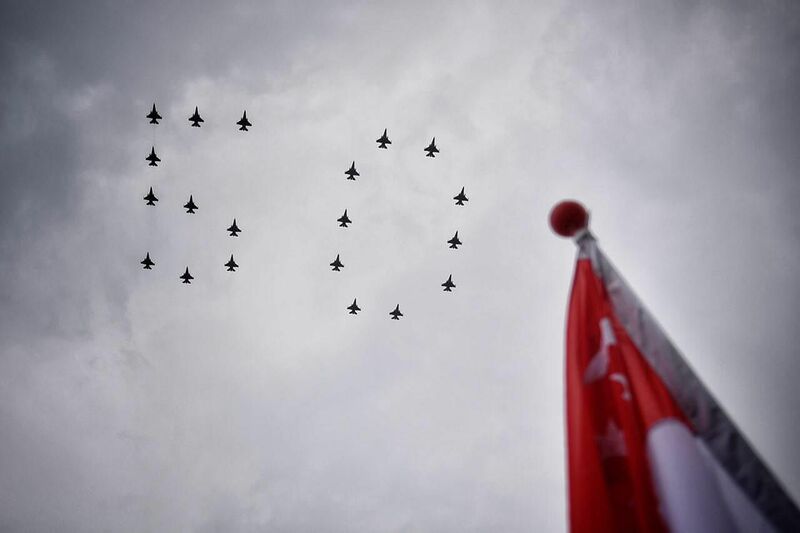 Elaborating on one of the challenges, RSAF's Colonel Ho Kum Luen, 38, co-chairman of the joint working group organising the fly-past, said: "Because it's such a big formation, it's very difficult to manoeuvre the whole formation... We had to get everything right down to the second." 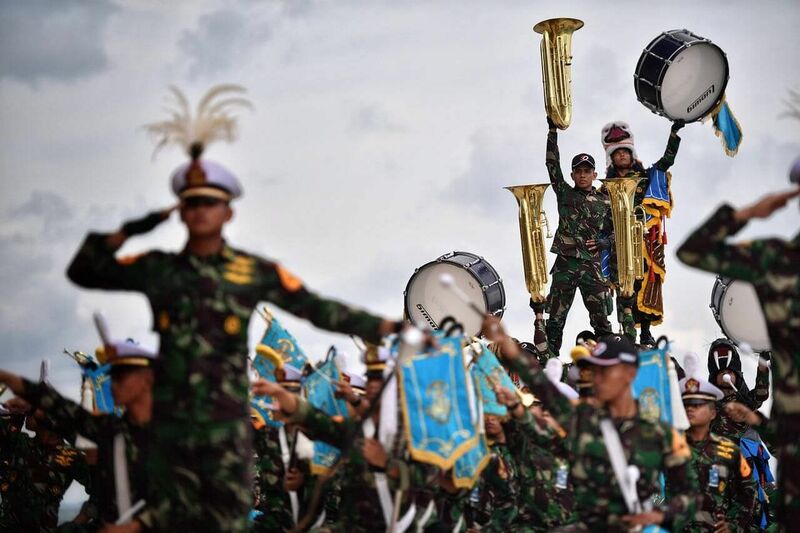 At the final rehearsal, a combined band performance between the Singapore Armed Forces Central Band and the Indonesian TNI Academy Band also took place between the two formations, when the aircraft had to re-organise to form the "50" formation. 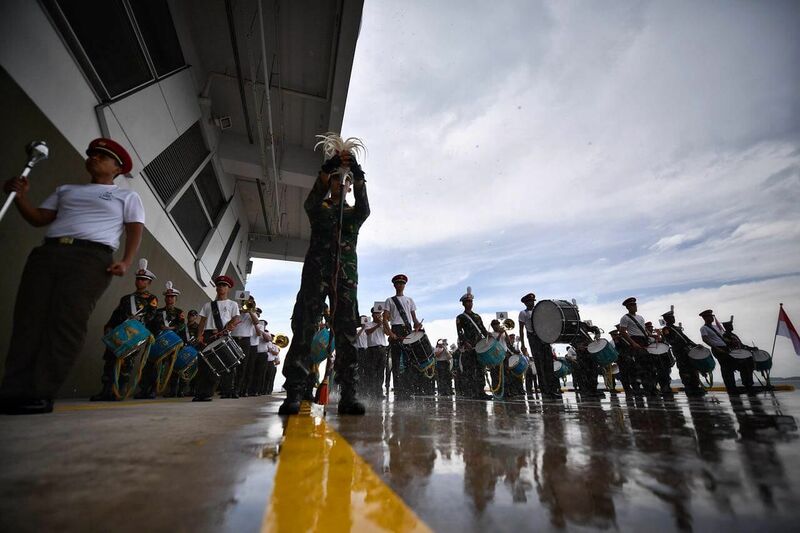 The SAF band played a medley of four local songs, including We Will Get There and We Are Singapore, while cadets from the TNI-Academy twirled their drum sticks and swung their bass drums to the beat of Taruna Jaya. Col Ho said that the event is a testament to the good relations between the two air forces. "This event is not just to commemorate 50 years (of diplomatic relations). Yes, we want to put on a good show... but to me the most important aspect is really the deepening of personal relations between the two air forces," he said. These bilateral exercises and training include Ex Eagle Indopura, the Singapore Armed Forces' longest-running bilateral exercise with any foreign military, and the Joint Fighter Weapons Course.